The Central Arizona Project carries Colorado River water to desert cities, including Tucson, and to tribes and farms. Intake pipes that were once underwater sit above the water line along Lake Mead near Boulder City, Nevada, in this 2015 photo. The Central Arizona Project is a system that carries Colorado River water to desert cities, tribes and industries in Arizona. Arizona, California and Nevada negotiators are moving toward a major agreement triggering cuts in Colorado River water deliveries to Southern and Central Arizona to avert much more severe cuts in the future. As state water officials now envision the agreement, it would also ultimately require California to cut its use of river water. That’s despite a 48-year-old law that says the Central Arizona Project must relinquish all its supply during shortages before California loses any. Terms of an agreement are still being negotiated, but water officials say these cuts are made necessary by a continued drop in the level of Lake Mead over 16 years. Lake Mead stores the river water that serves cities and farms in the three states, including drinking water for the Tucson and Phoenix areas. The $3.5 billion Central Arizona Project would lose nearly 15 percent of its water supply as early as next year. That’s even though conditions on the river and Lake Mead today aren’t yet serious enough to mandate cuts, according to the 2007 guidelines under which the river is now managed. Assuming Lake Mead continues declining over the next decade, CAP’s deliveries could gradually be cut up to 40 percent. California would face smaller cuts in Colorado River deliveries once Lake Mead dropped a little more than 30 feet below where it is today. California would ultimately lose barely 8 percent of its river supply. But to many observers it’s remarkable that the state would take any cuts, since the 1968 law that authorized CAP’s construction gives California first priority to river water during shortages. For the first time, Arizona water officials are talking of trying to spread CAP cuts to all sectors of the state’s economy that currently rely on project water for drinking and irrigation — cities, farms, industries, Indian tribes and others. Historically, the state’s plan has always been to cut CAP deliveries only to Central Arizona farmers in the early years of shortages and to cut off cities and tribes possibly much later. Nevada would take a much smaller share of cuts, because it has the right to only 300,000 acre-feet of Colorado River water, compared to 2.8 million for Arizona and 4.4 million for California. The U.S. Bureau of Reclamation, which operates Mead, would cut another 100,000 acre-feet annually by finding “efficiencies” such as lining irrigation canals to limit seepage or possibly by opening the long-shuttered Yuma Desalination Plant. Fears of huge cuts in river water supplies have grown in recent years, since Lake Mead started to decline as much as 12 feet a year in the early 2000s. The decline is due partly to ongoing drought aggravated by climate change, and partly to overuse of water on the long-over-allocated river. It’s estimated the river has a “structural deficit” of up to 1.2 million acre-feet a year. Officials of the three Lower Colorado River Basin states have been negotiating to try to stabilize lake levels since last summer. But by December, progress toward a settlement was slow enough that Deputy Interior Secretary Michael Connor warned state water officials that if they couldn’t reach agreement soon, the feds would impose a solution. 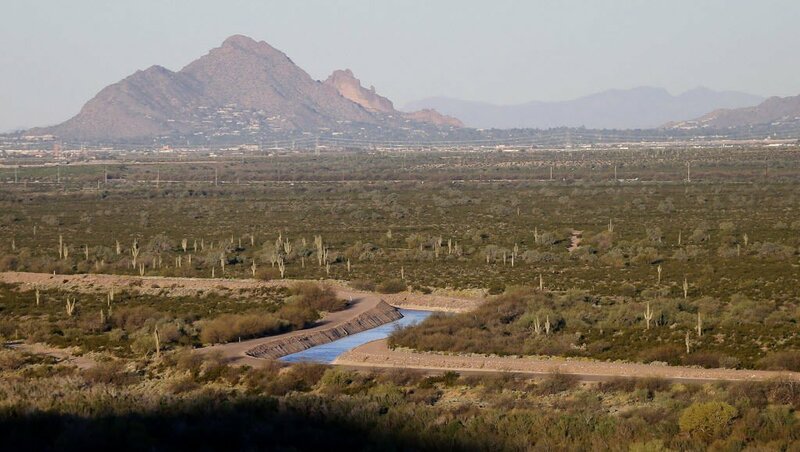 By last week, the three states were making enough progress that Arizona water officials were meeting privately with water users around the state to lay out potential terms of an agreement. Tucson Water officials have briefed City Council members on the negotiations. In midweek, a state water official presented a slide show discussing the possible agreement to the Southern Arizona Water Users Association, a group representing most area municipal water utilities and private water users. On Friday, negotiators for Arizona and California said they haven’t reached formal agreement, but both sides are open to the terms of the agreement being discussed. Arizona’s Legislature — but not California’s Legislature — must approve an agreement, meaning that state water officials have a big selling job ahead of them. He said he believes California will come to terms with Arizona because if Lake Mead’s decline is not slowed, potentially everyone will suffer, including California. During that state’s prolonged drought, Southern California cities were able to take out river water they had stored in Mead in previous years because the lake still had enough water to supply it, Buschatzke said. That lake water was a critical component of the state’s ability to deal with the drought, he said. Tanya Trujillo, director of California’s Colorado River Water Board, said all parties are working in good faith to try to pull together an agreement beneficial to her state and the entire Lower Basin. California hopes to get benefits from an agreement such as being allowed to continue to leave some water in Lake Mead during years of surplus that it could use later during droughts, she said. A graph prepared by the Arizona water agency shows how much more severe the cuts could be if nothing is done, Buschatzke said. The graph predicted what would happen if the river basin had the same dry, warm weather that occurred from 2002 through 2011. If the states do nothing, Mead could drop by 2022 to barely 1,000 feet, the graph shows. In 2023 and 2024, the lake could approach 995 feet. At such levels, Arizona could lose three-fourths of its CAP water. But under the plan now being discussed, Mead would drop no lower than 1,015 feet by 2023, and rebound to 1,050 feet by 2025. Arizona would lose no more than 40 percent of CAP. But California officials say the legislation that Arizona water officials want is unneccessary and counterproductive. Arizona, California, Nevada need to find solution as Lake Mead dwindles. The April-July forecast for Colorado River runoff into Lake Powell is 74 percent of average. • Arizona would lose 192,000 of its 1.5 million acre-foot Central Arizona Project supply starting next year. When Lake Mead dropped below 1,075 feet, CAP would lose 512,000 acre feet. Below 1,045 feet, CAP loses 640,000 acre-feet. Below 1,025 feet, CAP loses 720,000 acre feet. • California would lose 200,000 acre feet of its 4.4 million acre-foot river supply when Mead dropped below 1,045 feet. It would lose 300,000 below 1,030 feet and 350,000 below 1,030 feet. • Nevada would lose 8,000 acre feet until Mead dropped below 1,045 feet, and 10,000 acre feet after that. • The U.S. Bureau of Reclamation would save 100,000 a year in additional water annually starting next year. Negotiations for Colorado River water moving ahead. The reservoir stores Tucson and Phoenix's drinking water from the Colorado River. Cuts would reduce the unused water cities can store for a drier future. Farms would be hit, too. Sought by Arizona Sen. Jeff Flake, the Interior Department agreement could form the basis of a long-term pact.